Family Support Subsidy Program: The Family Support Subsidy Program offers financial assistance to the families of children with severe developmental disabilities. The goal of the program is that this child will be able to remain with or return to their birth or adoptive families. Medicaid: Medicaid is the Department of Health and Human Service’s health care program which is available to those in Michigan who can’t afford it. The programs have income and asset limits and are meant to assist those who are in a lower income bracket. The Children’s Health Insurance Program (CHIP): The CHIP program provides low-cost health insurance coverage to children in families that earn too much money to qualify for Medicaid. This coverage applies to routine check-ups, emergency services, laboratory and X-ray services, prescriptions, and many other medical needs. MIChild: MiChild is a health insurance option for children who are not covered by another insurance. The program has income requirements similar to other programs, but its goal is to provide insurance to children of working parents. Women, Infants, and Children (WIC): The Special Supplemental Nutrition Program for Women, Infants, and Children is a federal assistance organization which offers Nutrition and Food Services to women, infants, and children. The health program has positively impacted many women across the state and their pregnancy outcomes, as well as the growth and progress of many children. Early On: Early On assists families with children between birth and three years of age who have been diagnosed with a disability or may be experiencing general delays in their development. The disabilities they work with most are autism, Down syndrome, cerebral palsy, blindness or visual impairments, deafness or hard of hearing, and speech and language-related issues. Head Start Michigan: Head Start is a program run by the United States Department of Health and Human Services which offers education to preschool children of low-income families, including children with disabilities. Children who participate experience a wide variety of educational activities and also receive meals and snacks, health care and dental care, and safe playtime. Michigan Department of Education Office of Special Education and Early Intervention Services for Michigan: The Office of Special Education (OSE) oversees the administrative funding of education and services for children ages 3-21 with disabilities. Michigan Transition Work: Michigan Transition Work is funded under the Individuals with Disabilities Education Act (IDEA) through the Michigan Department of Education to offer services to prepare individuals with disabilities for life post-school. Michigan Career and Technical Institute: The Michigan Career and Technical Institute offers vocational and technical training programs and supportive services to help prepare individuals with disabilities for competitive employment. Michigan Rehabilitation Services: Michigan Rehabilitation Services works within the community to achieve quality employment and independence for people with disabilities. The organization helps disabled individuals in all 83 counties find competitive employment. Lake Michigan Academy (Grand Rapids, MI): The Lake Michigan Academy is the only school in West Michigan which focuses entirely on educating children with learning disabilities. The school teaches students in grades 1-12 and devotes itself to encouraging students’ strengths and working at their individual paces. Child Care Resources: Child Care Resources works collaboratively with child care providers, businesses, parents, and the community to provide individuals who need assistance access to quality childcare and early education. Briarwood Milestones Neurorehabilitation Program (Ann Arbor, MI): The Pediatric Neurorehabilitation Program is a part of the University of Michigan Health System focused on treating children, teens, and their families as they recover from brain injury or significant neurological disease. They offer psychology/neuropsychology, occupational therapy, physical therapy, case management, specialty programs, therapeutic recreation, special education/therapeutic school, and speech-language pathology. Hospital School Program (Ann Arbor, MI): The C.S. Mott Children’s Hospital School Program offers certified teachers on the hospital’s campus who coordinate with a child’s school to be able to continue a child’s education during their hospital stay. This schooling offers patients structure, distraction from illness, and a focus on a future outside of the hospital. Ann Arbor Academy (Ann Arbor, MI): The Ann Arbor Academy is a private school for students with learning differences in grades four through twelve. They assist students who have autism spectrum disorder, AD/HD, and language based learning disabilities. Center for Neuropsychology, Learning and Development (Ann Arbor, MI): Center for Neuropsychology, Learning, and Development serves the community by providing quality mental health care to children, adolescents, adults, and families. They offer assessment, therapy, intervention, and advocacy and specialize in many different types of disabilities. Student Advocacy Center of Michigan: The Student Advocacy Center of Michigan strives to helping vulnerable students stay in school or get back into school. They focus their programs on youth in a foster care or a homeless situation, youth affected by school discipline, youth facing challenges enrolling in school, economically disadvantaged youth, and students with mental illness. Center for Speech and Language (Troy, MI): The Center for Speech and Language offers treatment for language, speech, and learning challenges. They serve a broad range of students, including those with Autism Spectrum Disorder, Apraxia of Speech, Auditory/Linguistic Disorders, and many others. The Arc of Oakland County: The Arc of Oakland County works through research, education, and advocacy to improve the quality of life for children and adults with intellectual, cognitive, and developmental disabilities in every community. The Arc maintains the goal of helping individuals with developmental disabilities achieve their goals. Rainbow Rehabilitation Centers (Livonia, MI): Rainbow offers After School and Saturday Programs which are designed to assist children who have sustained a traumatic brain injury by advancing their treatment goals and helping them achieve academic and social success. They facilitate structure for children through individual tutoring, group or individual therapies, recreational activities, and social skills training, and group academic support. The Epilepsy Foundation of Michigan (Southfield and Grand Rapids): The Epilepsy Foundation of Michigan offers scholarships for students with epilepsy who seek to attend college. Furthermore, the foundation generally aims to overcome the challenges facing those with epilepsy and assist in therapies that save lives, stop seizures, and find a cure for epilepsy. Individual School Districts in Michigan: Nearly every individual school district in Michigan has resources allocated towards assisting children with disabilities on their main campuses and as part of their schools. To determine eligibility, contact your school’s administrators. Children’s Special Health Care Services: Children’s Special Health Care Services is a part of the Michigan Department of Health and Human Services and strives to improve health outcomes for individuals with special health care needs. The program offers coordinated services, culturally competent services, family-centered, services, community-based services, and coverage and referral. Children with Special Needs Fund: The Children with Special Needs Funds exists as part of the Children’s Special Health Care Services program to help children with special health needs when they are unable to receive other funding. Michigan Developmental Disabilities Council: The Michigan Developmental Disabilities Council is a part of the Michigan Department of Health and Human Services which aims to offer support and opportunities to all people that they may achieve their goals. Their aims are to advocate for the treatments and services of the disabled, to put government grants to use for the betterment of the disabled, to work with other service agencies to help the disabled, and to maintain local advocacy groups across the state. Services to Children with Developmental Disabilities: Services to Children with Developmental Disabilities is an aspect of the Michigan Department of Health and Human Services which establishes guidelines and procedures for implementation of different policies to assist children with developmental disabilities in Michigan. Disability Concerns Commission: The Michigan Commission on Disability Concerns advocates on behalf of those in Michigan with disabilities by offering disability rights training, working with the Michigan Business Leaders Network on employing those with disabilities, conducting disability awareness and sensitivity training, offering technical assistance, and doing other services for those in need. Enhanced Mobility of Seniors and Individuals with Disabilities Program: The Enhanced Mobility of Seniors and Individuals with Disabilities Program is a part of the Department of Health and Human Services which allocated funds to increase mobility for seniors and those with disabilities. Lighthouse of Oakland County: Lighthouse is a nonprofit organization which aims to provide housing and food to low-income families. They also offer services which focus on helping people becoming financially independent, self-sufficient, and more motivated. There are other Lighthouse organizations across Michigan as well. Family Hope Foundation: Family Hope Foundation is a program based in West Michigan which aims to provide support, funding for therapies, activities, and resources to families of children with special needs. They especially focus on providing scholarships for therapy because they feel therapy is an imperative part of helping children with disabilities thrive and funding for therapy is often not covered by insurance. Hope Network: The Hope Network is an organization which provides therapies and assistance to those facing any manner of social, physical, or mental barriers. They offer developmental services, community support services, behavioral health services, and rehabilitation services to more than 200,000 people in Michigan every year. Great Lakes ADA Center: The Great Lakes ADA Center strives to provide information, technical assistance, materials, and training on the Americans with Disabilities Act of 1990. Michigan Alliance for Families: The Michigan Alliance for Families strives to offer support, information, and education to families of children who receive, or wish to receive, special education assistance. The website connects families with helpful resources and helps them to advise others on how to teach their children, know their own rights, and communicate their child’s needs. Wayne State University Developmental Disabilities Institute: The Wayne State University Developmental Disabilities Institute provides programs to help improve the lives of those with developmental disabilities across Michigan. They offer support to communities, service providers, and systems, research on disability issues, education to all people, information that assists with training and applications, and evaluation of programs. University of Michigan Center for Language and Literacy: The University of Michigan Center for Language and Literacy helps children, teens, and young adults with language and language-related disorders get the help they need. They offer speech-language evaluations and therapy services. University of Michigan Department of Otolaryngology Sound Support: The University of Michigan Sound Support program is made up of audiologist and auditory-verbal therapists/speech-language pathologists to assist children and families of children with hearing loss. University of Michigan Center for the Child and Family: The University of Michigan Center for the Child and Family offers various mental health services for children, adolescents, and families with focuses on relationship issues, social skills, general emotional and behavioral concerns, attention and learning disabilities, and many other key areas of mental health. United Cerebral Palsy of Michigan: United Cerebral Palsy of Michigan strives to connect individuals with disabilities with the information they need to achieve their goals. They offer resources for families of those with CP and teens and adults with CP. Their website also offers extensive information on assistive technologies, the Work Incentives Planning and Assistance program, and many other key resources for those with cerebral palsy. Brain Injury Association of Michigan: The Brain Injury Association of Michigan aims to connect those with brain injuries and their families to the vast network of relevant services offered by the state: medical treatment facilities, programs and professionals, care providers, and brain injury rehabilitation centers. The Arc Michigan: The Arc of Michigan aims to support those with Intellectual and Developmental Disabilities in Michigan and their families. They achieve this goal by supporting government advocacy at the local, state, and national levels, promoting autonomy and self-determination, providing training for parents and professional, and offering many more services to those in need. Learning Disability Association of Michigan: The Learning Disability Association of Michigan strives to improve the well-being of those with learning disabilities and their families by offering support, advocacy, training, research, and service. The Epilepsy Foundation of Michigan: The Epilepsy Foundation of Michigan strives to help those living with epilepsy overcome the challenges they face by pursuing therapies that could stop seizures and save lives. They provide community education, advocacy, collaborative efforts, research, epilepsy management information, and social opportunities to those in Michigan with epilepsy and their families. March of Dimes of Michigan: March of Dimes is an organization whose main focus is premature birth, birth defects, and infant mortality. A large part of the website’s aim is to provide key information about these concerns to expecting and new parents so that they can know what health problems to look for in their premature babies. Hope for HIE: Hope for HIE is an organization which strives to give education, support, and awareness to families struggling with HIE. The website provides abundant HIE educational resources as well as information about different charity events given by the organization. The organization is also located in West Bloomfield Township, Michigan. Michigan’s Integrated Technology Supports: Michigan’s Integrated Technology Supports works to provide training, technical assistance, information services, and supporting materials to local and intermediate school districts in Michigan. The goal of these resources is to get the correct and best assistive technologies and equipments for those with special needs in schools across the state. Wings of Mercy East Michigan: Wings of Mercy East Michigan offers air travel at no cost to families of East Michigan with financial needs who require special medical treatments in distant locations. Their goal is to ease the cost of travel because travel for medical necessities is not covered by health insurances. Wings of Mercy West Michigan offers air travel at no cost to families of West Michigan with financial needs who require special medical treatments in distant locations. Their goal is to ease the cost of travel because travel for medical necessities is not covered by health insurances. VSA Michigan: The VSA of Michigan aims to provide an environment in which those with disabilities can learn through, participate in, excel in, and enjoy art. They view art as a communicative connection between all people and an inclusive way for everyone to express themselves, including those with disabilities. Need help beyond what’s listed in our Michigan Birth Injury Resource Guide? If you believe your child suffered a birth injury as the result of medical malpractice, you may be eligible for compensation. Children with cerebral palsy, seizure disorders, brain damage, hypoxic ischemic encephalopathy (HIE), and other birth injuries and disabilities from birth injuries often require intensive and expensive health care and lifestyle adjustments. Compensation from a successful medical malpractice claim can help your loved one live a more complete, fulfilling life of rehabilitation and well-being. 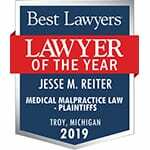 The nationally-regarded and highly decorated attorneys at Reiter & Walsh, PC have over 50 years of joint experience handling birth injury cases. For a free case review with our legal team, you may contact us toll-free by phone at 888-419-2229, by completing this online contact form, or by pressing the Live Chat tab to the left of your browser. More Birth Injury Resources from Reiter & Walsh, P.C.